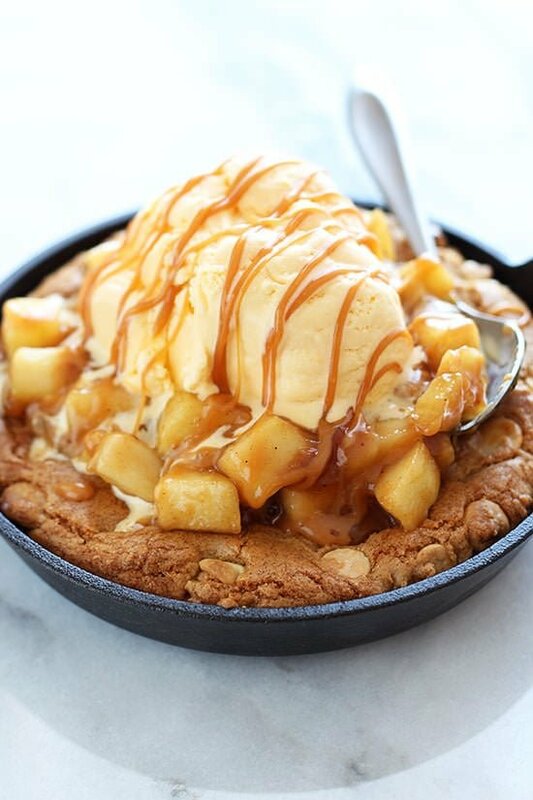 Salted Caramel Apple Pie Pizza Cookie is a white chocolate chip pizza cookie topped with fresh caramel apple pie filling, ice cream, and more caramel. Amazing decadence! Taste: Like apple pie but enhanced with salted caramel and white chocolate. YUM. Texture: Chewy, ooey, gooey, soft, thick, rich, creamy, ahhhhh!! Ease: Much easier than making apple pie from scratch. Don’t be overwhelmed by the ingredient list, it looks long but it’s all really easy. 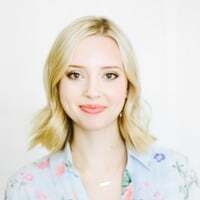 Appearance: I mean, c’mon. This definitely looks like something you’d get at a restaurant! 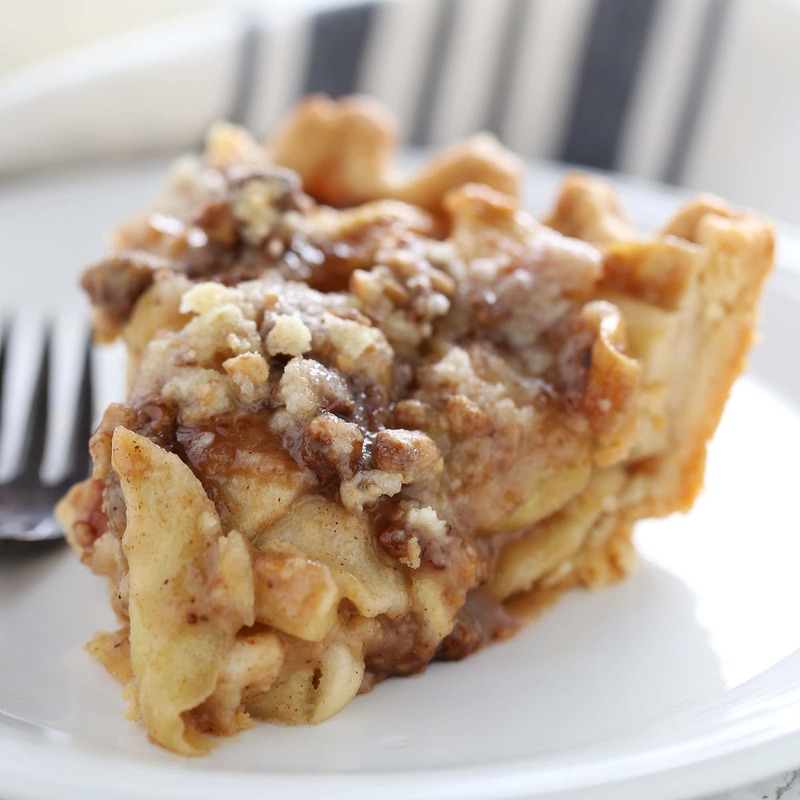 Pros: Incredible and indulgent twist on apple pie. Cons: Not an everyday treat. Would I make this again? Yaaaas. You guys, I’m really onto something here. I feel like this a lot when I get ready to share a new ridiculous over-the-top treat with you but this time it’s really really true! I mean, just look at these pictures. I wish I could remember where in the world the idea for this recipe came from, but I really think it just popped into my brain and I was forced to run to the store to grab everything needed. The side effects of food blogging. 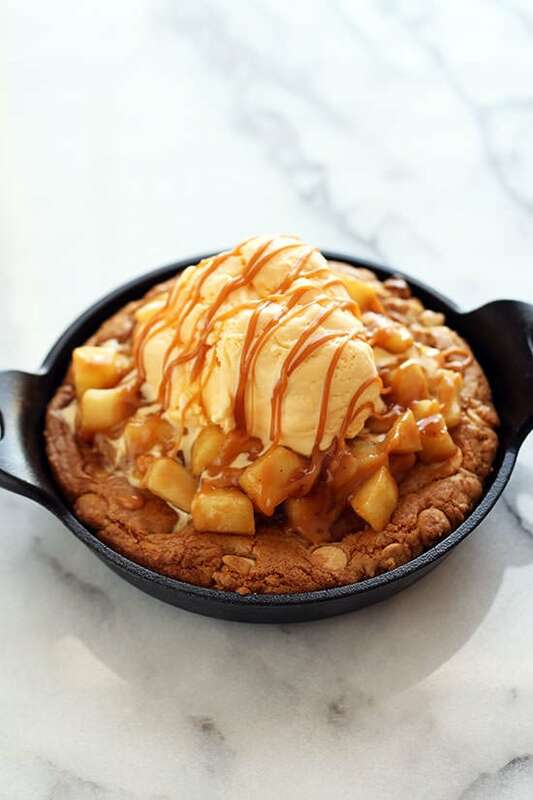 What kind of crazy awesome world do we live in where a recipe for Salted Caramel Apple Pie Pizza Cookie can exist? 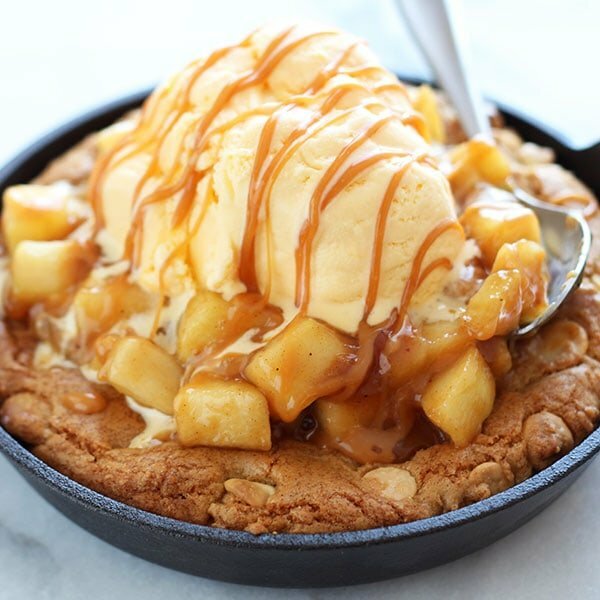 This recipe takes an ooey gooey undercooked white chocolate chip pizza cookie and tops it with salted caramel apple pie filling. THEN we go an top it with ice cream and more salted caramel. There are a lot of horrendous things happening in our world but in my little corner of the internet I just want to make your life a little more delicious. 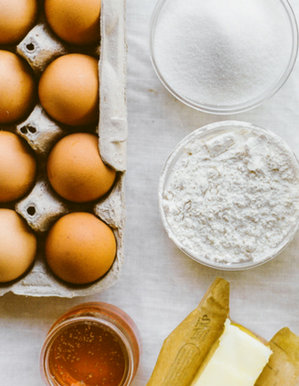 This recipe will make it a LOT more delicious. It actually makes two 6-inch pizza cookies, so it’s perfect for serving your whole family. If it’s just the two of you, refrigerate the apple pie filling and reheat both the cookie and the filling when you’re ready for day two of this madness. 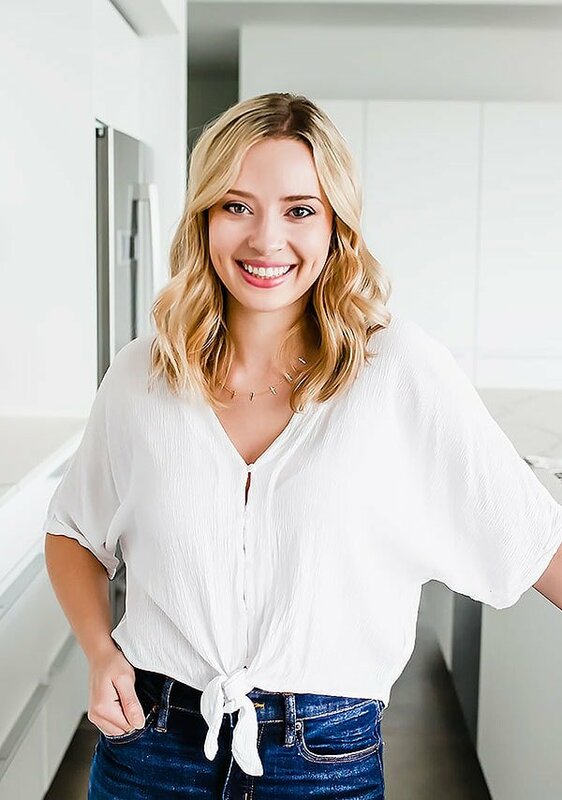 Run, don’t walk, into the kitchen to make this recipe! If you love apple pie and/or pizza cookies (who the hell doesn’t?) 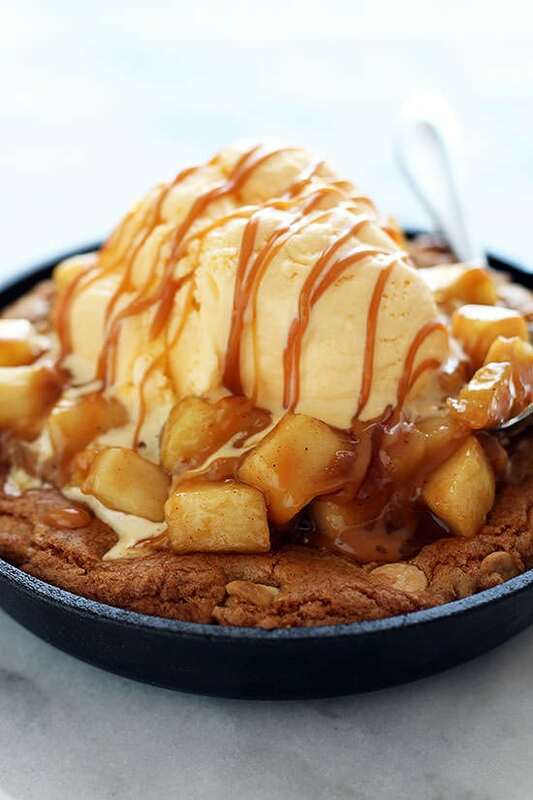 you are going to freak over this Salted Caramel Apple Pie Pizza Cookie recipe. Mmmhmmm. If you’re wondering, I used these Lodge Cast Iron Mini Round Serves to make these pizza cookies, they’re my absolute favorite! Preheat the oven to 400°F. 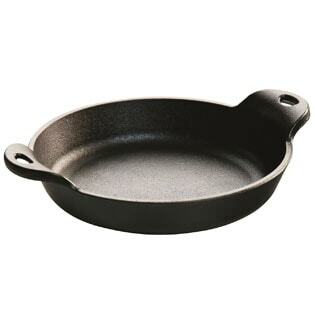 Spray two 6-inch pie plates or cast iron servers with nonstick cooking spray. 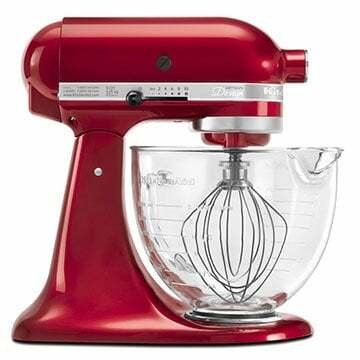 In a medium bowl whisk the flour, baking powder, baking soda, and salt to combine. In a large bowl stir the butter with the sugars. Let cool slightly if the butter is still hot. Whisk in the egg and vanilla and beat until combined. Add in the flour mixture and stir with a spatula until incorporated. Fold in the white chocolate chips. Divide the dough between the prepared pie plates. Bake for about 15 minutes, or until the edges are slightly browned but the inside is still gooey, or until desired doneness. While the pizza cookies are baking, make the topping. Toss all the ingredients except the butter in a large bowl. Melt the butter in a large skillet over medium-high heat. Add the apple mixture and cook, stirring often, until the apples soften, about 8 minutes. Keep warm until ready to use. 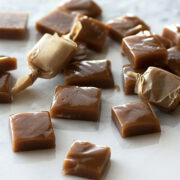 Place the caramels and cream in a small saucepan set over medium-low heat. 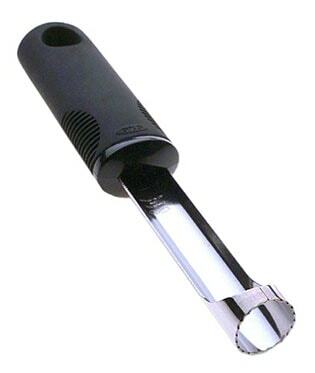 Cook, stirring constantly, until the mixture is melted and smooth. Stir in the salt. Divide the apple topping among the warm pizza cookies. Top each with a scoop of ice cream and drizzle with the caramel sauce. Serve very warm. OMG, i need cast iron servers, but it’s really hard to get them here in austria. This Cookie looks amazing and mouth-watering all together :D.
I LOVE how this is all made from scratch!! I can’t wait to try it! Totally over the top, but AMAZING! Caramel apple is just a winning combo and I love how this is so much easier than a normal apple pie and it looks absolutely amazing, I would definitely love this to be served in a restaurant! When I try to pin the Salted Caramel Apple Pie it pins the Caramel Apple Strusel Pie. Your pin it thingy doesn’t work for this posting. ??? Or am I doing something wrong. 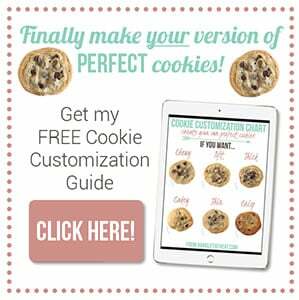 Can the cookie be made ahead and frozen? If yes, how can it be assembled on serving day? 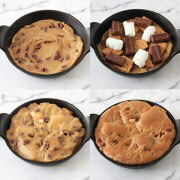 If you live in a city with a BJ’s Restaurant & Brewhouse, you might recognize the look of this treat as being like their Pizookie dessert. The difference seems to be in the toppings. That dessert (in the triple chocolate flavor) is one of my two very favorite in the world. Definitely a great idea! oh my gawd. . holy yum is right! I have a little mini cast iron skillet I’ve been waiting to use. .and now I know that i’m going to make. . love this!!! salted caramel perfection! yum! Love those mini cast irons! This dessert is beyond amazing, I need it now! So so happy that we live in a crazy awesome world like this! Sinful!!!! And so worth the indulgence!! I just had a chocolate chip skillet cookie at a restaurant last weekend (topped with vanilla gelato) and am now craving your apple pie version. Brilliant! Loving this idea! Gorgeous! Pinned! I don’t know what kind of world it is, but I’m GLAD I’m living in a world where this pizza cookie exists. This sounds decadently addicting. Hi! I’ve made this recipe a bunch of times – my family loves it – especially in the fall time! I was thinking to make this recipe as individual desserts for a dinner party. I wanted a not-so-typical mini dessert starring apples (my go to would have been individual apple crisps) and I think these would be perfect!! Any serving suggestions for a more elegant presentation? Any way to bake this up in a pretty cupcake cups? Thanks!